Q: Why do I need a physical exam to refill medication? A: 1. Even if your pet is taking a medication for life, your veterinarian must do a physical exam to be sure there are no changes in your pet's condition. In some cases, a blood test may be needed to be sure your pet still requires the same dose of medication. Medication doses must be accurate to maintain your pet's health. 2. Observed symptoms can be very similar, but have a very different cause, and require very different treatment. One example of this might be that your pet seems to have an itchy skin condition every year, and receives medication for it. However, if this time your pet has a fungus (i.e., ringworm), the symptoms might appear the same, but the same medication could actually spread the ringworm and make it worse. Another example might be that your pet is squinting and seems to have an eye infection, however, if your pet has scratched his eye, the medication would be different. You should never use eye creams or ointments without a visit to the veterinarian or you could damage your pet's eye. Q: Do I need to call the specific office of the Ridgewood Veterinary Hospital that I am trying to reach? A: You can call any office to schedule an appointment in all three locations: Ridgewood, Midland Park, or the Whole Dog Grooming Salon. If you have a question that can only be answered by someone in that office, we can transfer your call to them. Q: If I usually go to one office, will my pet's medical records be available to doctors in the other office, and will they know me and my pet? A: Our computer databases are joined, and medical records are updated in each office. Our staff is rotated, so you will see the same faces in each office of the hospital. 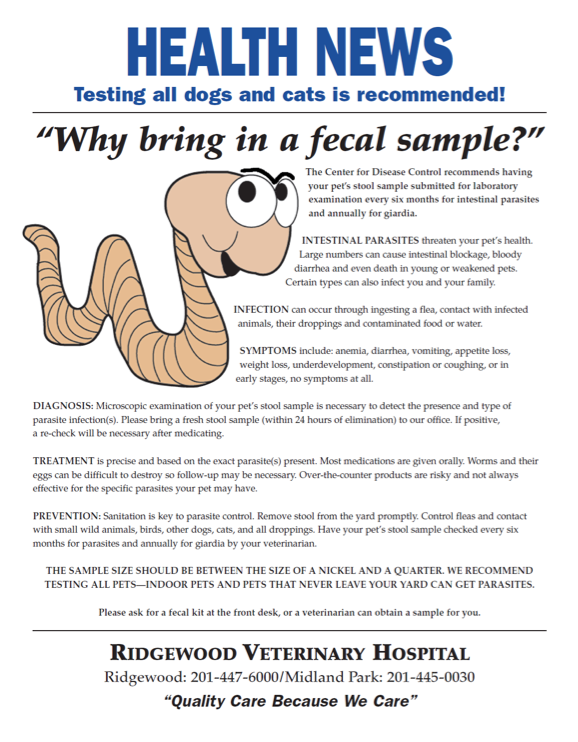 Q: Why should I bring my pet to the Ridgewood Veterinary Hospital? A: The Ridgewood Veterinary Hospital is committed to helping pets and the people who love them by combining the highest quality of medicine, technology, and service provided by our caring staff. This dedication to consistent excellence, throughout each pet's entire life, is demonstrated by our endless pursuit to find new and creative means to diagnose, treat and cure disease, and to begin where medical books end. Our veterinarians and support staff are caring, skilled professionals. We hope to care for your pet from infancy through senior years. Try us! Q: Can I call to get an estimate of how much services will be? A. We understand this economy is a difficult one for many people. If cost is an issue, feel free to ask how much any procedure will be. We always want to give individualized Medical Care Plans when your pet is admitted into the hospital, for authorization and an estimate of fees. However, you can always ask, even in an appointment, how much a doctor's recommendations will cost before it is performed. If you are a new client, our Client Care Representative will ask you a series of questions for basic care, but for anything more detailed or for specific conditions, a veterinarian will want to see your pet's condition before giving you a medical care plan and an estimate of fees.